Not a lot of people would accuse Barcelona label Desigual of being extremely in sync with millennial culture in general; they manufacture mid-range, brightly colored clothing in patchworks and prints that are reliable and functional, never really hewing to trends. 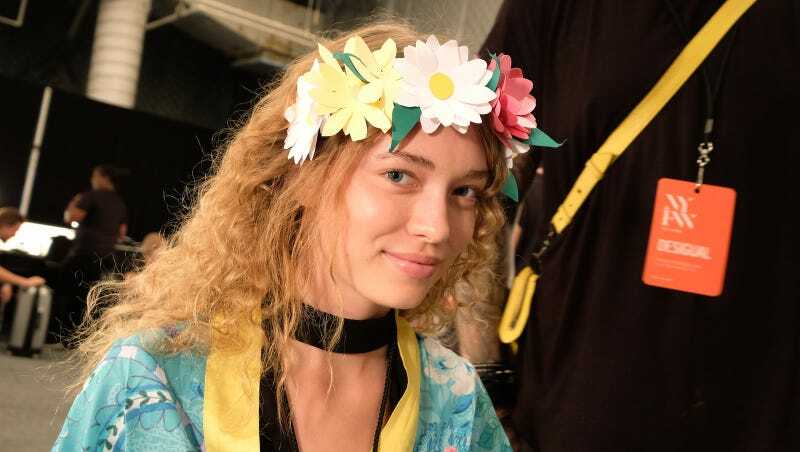 At their runway show Thursday for New York Fashion Week, though, they injected a bit more fun into their normal fare, recreating all your favorite snapchat filters on the faces of their models whether with make-up or with personality. And with it, the brand brought younger-seeming clothes along with it, perhaps making a protracted point about the direction in which it’s going. Or perhaps it’s just reflecting how Snapchat threatens to overtake all our lives. Nevertheless, these were looks I liked; a cute patterned miniskirt with pompom embellishments, fringe-y sandals in keeping with the times, a lace dress and white leather moto rendered carefree with a paper flower crown. The lady on the left maybe felt left out so gave us a little bit of the dog-tongue filter, which is both cute and heartening that she’s having fun, as opposed to the models at the Yeezy show from yesterday. (Models really need to massively unionize.) Tiger-face model is wearing an almost-diaphanous nightgown I’d wear immediately, and I’m not sure if there’s a rosy neck scarf filter as yet, but there should be one. So pretty! Early Halloween ideas!